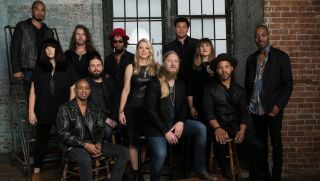 Tedeschi Trucks Band, featuring guitarist Derek Trucks and vocalist/guitarist Susan Tedeschi, have announced a new album and 2019 U.S tour dates. The new, still-untitled effort, will be their fourth studio album and first in three years. It is slated for release in early 2019. The 2019 tour dates kick off January 17 in Cedar Rapids, Iowa, and include multiple shows in Chicago, New Orleans, Nashville and Washington, DC. The spring dates will also include a return visit to Europe that will conclude with two nights in London. The full tour itinerary is below. For more information head over to TedeschiTrucksBand.com.